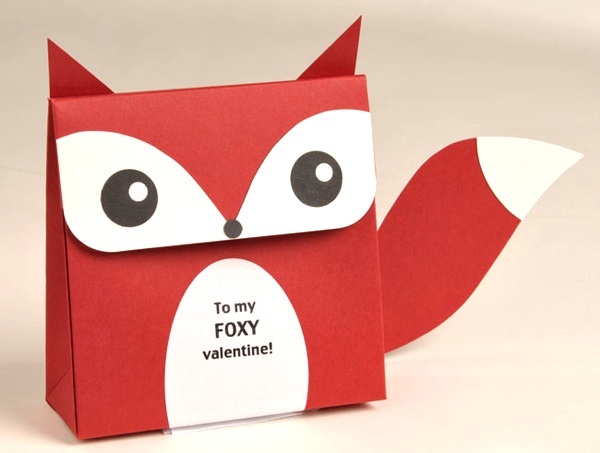 This pocketbook favor box has been totally disguised as a fox – perfectly festive for your Foxy Valentine! This is a super easy Valentine craft – just use our How To PDF to trace and cut a few simple paper shapes. Fill with Valentine goodies, or give as Valentine cards (sure to impress!). 1. Using Super Tacky Tape, assemble Pocketbook Favor Box according to instructions. 2. Trace templates and cut out pieces from How to Foxy Valentine PDF. Adhere pieces in place as pictured. 3. For eyes, punch out 1″ black circles and use a 1/4″ hole punch to create white pupils. 4. For the nose, use a 1/4″ black circle. 5. To create the chest, print your valentine message onto oval labels using our print template in Microsoft Word. Once you’ve typed your message, highlight your text and go to Format/Text Direction to change your text to a vertical orientation. We have a cunning little fox just like this one living outside our apartment complex! I’m going to make these little red foxes for some of my neighbors for Valentine’s Day! A great snow dat activity! I love these and am going to make some for my own Valentine’s! omg this is absolutely perfect .. valetines day is coming up and i was trying to find something perfect to give him and this would so suit him .. and i could put a little surprise inside 😉 this is like the best idea ever !! Hi! I featured you beautiful tutorial on my blog! your foxy is perfect. this is new idea.happy valentine s day for you. this is the cutest thing! though im having quite a bit of trouble finding the bags to make this, any suggestions. i dont have enough time to order them. super unusfuel cant do anything on this. Thank you for sharing! I just love the fox favor box! I will be making them for my grandson’s 3rd birthday! It’s so cute! Gonna try and make it to hold Valentine’s. Thank you for saving the problem of decorating a shoe box! I see that Paper Source no longer sells this pocketbook gift box. Do you have a downloadable template available for the box itself? I can’t seem to find one on-line, and I would LOVE to make these little foxes! Download the template to create your own!